I'm sorry, yall. I just can't help myself. This is hands down my favorite ecard ever. I look at it more than just about every Thursday. So today I got a big dose of thankful smack in the face in the middle of the Wendy's parking lot. Classy. Do you ever have those moments? When you just want to smell a frosty, no scratch that, I mean, when you just feel thankful? And it just hits you like a tsunami? Today was one of those kind of days. I've had some stuff distracting me and making me cranky and scared and every other emotion under the sun recently, but today I got some good news on that front. Like happy cry kinda news. I'm still not at the end of that particular journey but I can see the light at the end of the tunnel. Short and sweet today! Be thankful today! Comment me something that you are thankful for! My man. My babies. My cute house/HGTV-work-in-progress. And the fact that I am no longer in danger of blizzards! My family & my friends, don't know what I would do without them. 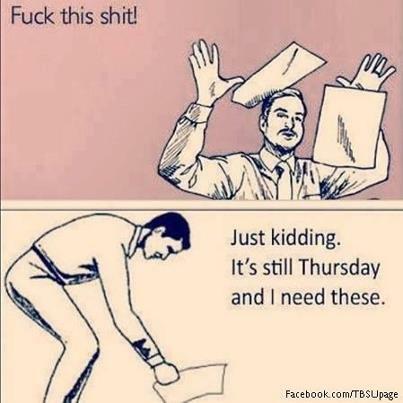 That is one of my alltime favorite ecards.. Never gets old! I hadn't seen that ecard. Hilarious! I'm from the Memphis blog group. Nice to meet you! That E-card is my Fiance's absolute favorite! It makes me giggle. New follower from the GFC blog hop! Looking forward to reading more of your blog.